Indulgence is bliss! 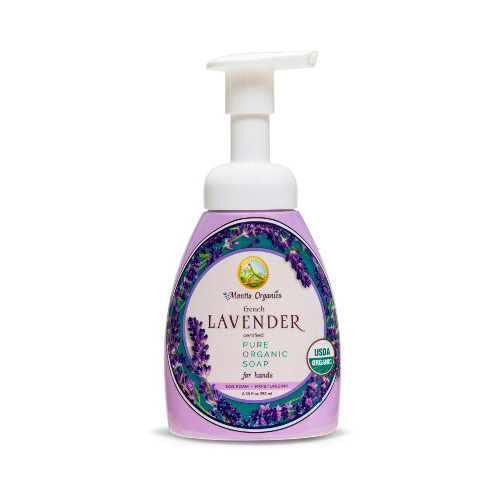 The Lavender hand soap by Mantis Organics is all about pampering your skin with a blend of pure, vegan-friendly ingredients. Detoxifying dull texture, hydrating pores and restoring skin’s complexion is as easy as one, two, three! This hand soap is so vibrant, you’ll have that addictive scent on your hands right from desk to dinner. Aloe Barbadensis (Aloe Vera) Leaf Juice*, Cocos Nucifera (Coconut) Oil*, Potassium Hydroxide, Lavandula Angustifolia (Lavender Oil)*, Helianthus Annuus (Sunflower) Seed Oil*. Sourced from the finest botanicals in the world, luxury now has a new name in Mantis Organics’ Lavender hand soap. Pamper your skin with pure plant extracts that scrub away dead cells, fade skin discoloration and restore your skin’s natural radiance. Taking you through a journey of the senses, nothing comes close to the delicious aromas of lavender and aloe vera oil or the rich creamy lather that re-energizes tired skin. USDA Certified Organic formula contains essential oils to unclog pores and stimulate faster surface cell renewal. Absolutely no harsh chemicals or propellants used in the manufacturing process. You can confidently invest in the perfect organic skin care solution. Experience quality ingredients for incredibly long-lasting effects!